If you’re having problems getting iCal to push events to the Calendar App on your iPhone through MobileMe, make sure you check to see if your settings are correct. I was having problems and I just assumed that it was a MobileMe issue and that once MobileMe was fixed, my problems would be solved. 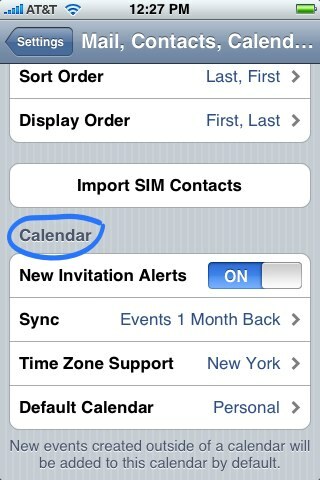 It turns out that the Calendar sync setting was turned off in my iPhone. but in the accounts section at the top of the same page. 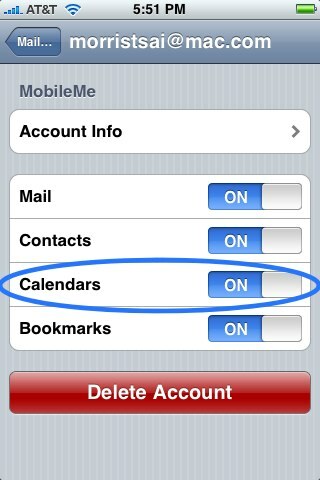 Click on the account that is your MobileMe account as shown below. 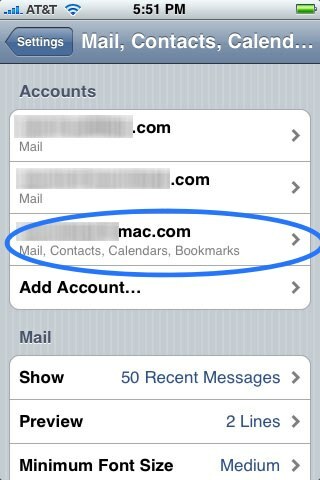 My MobileMe account is still my .Mac account email address. Make sure Calendars is switched to ON. When I checked this setting on my iPhone it was turned off which was the cause of my iPhone not receiving push Calendar updates. iCal on your Mac doesn’t automatically push new events to the MobileMe cloud, only when it syncs on its schedule. To have an event pushed to your phone, you need to select “Sync Now” in the sync icon of your Mac’s menu bar. Thanks very much, I had the same problem. I’m glad that i could be of help! thanks i had the same problem! !